Sovereign Body, Words, Language, Poetry & Stories. The Girls Run: A Review of the Mescalero Apache ‘Coming of Age Ceremony’ and the words written by Claire Farrer & Bernard Second”. “Our education preceded with learning to make our beds and hanging up our new clothes. Our old ones, I learned later, were sent to our families in Florida so that they might know that we were still alive. How they knew from that I do not know.” –Asa Daklugie, as transcribed by Eve Ball, “Indeh; An Apache Odyssey” (University of OK Press, 1988). What a great way to start out my first blog post of many blog posts. Since I obtained this website, I had been thinking about how to start incorporating my blog, and what I was going to write about. Many ideas, perspectives, and thoughts ran through my head about how to start. Naturally, it stressed me out because, there are times I have convinced myself I have nothing to say. I have included a quote from my great, great, great, great grandfather Asa Daklugie, from his recollection while placed in boarding school in Carlisle, Pennsylvania as dictated by historian Eve Ball. Eve Ball was a gracious woman to my family. I remember as a small child accompanying my mother Evangelina Apache to Eve Ball’s home in Ruidoso New Mexico. 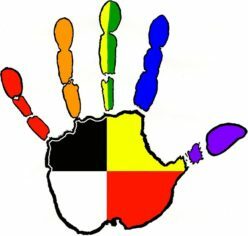 Today being Indigenous Peoples Day, I remember and celebrate the lineages of my ancestors. In doing so, it reminds me how fortunate I am to have had many successful experiences in my life. All I have accomplished have been in honor of my family and ancestors. Memory, how we choose to remember and honor those who have gone before us, can be a difficult task. Sometimes those memories have personal blockades and other time it is a public who do not want to be reminded of a past history. When I read the words in any book about Apache people, I am reminded about my history and legacy. How I choose to delineate my future and interpret my past is how I can begin to leave my own foot prints for the future. Like I stated early in this post, there is so much more to being Native American than just the name itself. So much of me is tied to memory. Creating memorial in writing is my attempt to document my history, my identity, my sexuality, my gender, and all those ties which contribute to my thoughts and emotions. So this is a good beginning. My hope is to continue writing passages that inspire. I have got to try and make something good, here. ‘Ixé‘he (Thank you).